The facility is a traditional hostel. It is well located in a lovely little town, and near the mountains. If you don’t mind shared bathrooms, a full kitchen to cook your meals, a reading area with a fireplace, meeting people, and more, then this is your place! Affordable, and cosy. 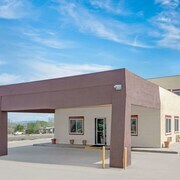 Where to find Taos hotels near an airport? Where can I find hotels in Taos that are near tourist attractions? Taos offers travelers and vacationers an amazing range of first-rate lodging options. Expedia currently lists 25 places to base yourself within a 0.1-kilometre (0.06-mile) radius of Taos' central area. Securing a place in central Taos is just a couple of mouse clicks away. Expedia's up-to-the-minute booking page lists the El Monte Sagrado Living Resort & Spa and Palacio De Marquesa, which are situated within a 1-kilometre (0.6-mile) radius of Taos' center. Alternative hotel areas include Eagle Nest and Red River. The Laguna Vista Lodge, Historic Restaurant and Saloon and Econo Lodge are in Eagle Nest, while Red River is where you'll find the WorldMark Red River and Alpine Lodge. Taos Ski Valley is 25 kilometres (17 miles) from Taos' downtown, while Wheeler Peak Wilderness Area is 25 kilometres (15 miles) from central Taos. The Powderhorn Suites & Condominiums and Snow Bear Inn are situated in Taos Ski Valley, while Amizette Inn and Restaurant and Rio Hondo Condominiums are situated in Wheeler Peak Wilderness Area. For a place to stay that is located in the area around the Taos Pueblo, check out the Touchstone Inn or the WorldMark Taos. 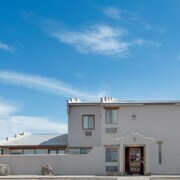 The Touchstone Inn is 3 kilometres (2 miles) away and the WorldMark Taos is 3 kilometres (2 miles) away. Here at Expedia, we understand that all travelers possess different requirements and budgets. So if you're searching for a hotel or appartment at the more affordable end of the range, the Taos area boasts some solid options. 35 kilometres (20 miles) from Taos' downtown area is where you'll find the Econo Lodge. The Best Western Rivers Edge is just 35 kilometres (23 miles) away. The Sun God Lodge and the Sipapu Ski and Summer Resort are another two lower-cost options worth checking out. 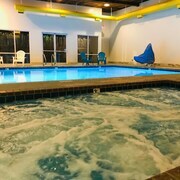 Check out the Blue Sky Retreat at San Geronimo Lodge and also the Dreamcatcher Bed and Breakfast. The Blue Sky Retreat at San Geronimo Lodge can be found 3 kilometres (2 miles) away from the heart of Taos. The Dreamcatcher Bed and Breakfast, is 0.8 kilometres (0.5 miles) away. Other Expedia-listed hotels are the Taos Country Inn and the Hotel La Fonda Taos. After you have enjoyed Taos, why not take the time to investigate the other attractions in the Northern New Mexico area. Northern New Mexico offers mountains and desert landscapes, and common Northern New Mexico attractions include traditional villages. Travelers in this region of United States of America often enjoy snowboarding. Downtown Santa Fe is 85 kilometres (54 miles) to the south of Taos and is home to the Museum of Contemporary Native Arts and Santa Fe Railyard. The Rosewood Inn of the Anasazi and Antigua Inn are some of the great accommodation options in Downtown Santa Fe. 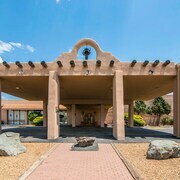 Alternatively, you could consider staying at Southern Santa Fe, 95 kilometres (58 miles) to the southwest of Taos, where you'll find the DoubleTree by Hilton Hotel Santa Fe and Courtyard by Marriott Santa Fe. Theaterwork Studio and Santa Fe University of Art and Design are a couple of the popular attractions to see when you're in Southern Santa Fe. Taos features some terrific scenic and cultural attractions; learn more by spending a few minutes at Expedia's Taos travel guide. What are the most popular Taos hotels? Are there hotels in other cities near Taos? 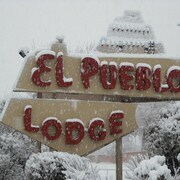 What other types of accommodations are available in Taos? Explore Taos with Expedia.ca’s Travel Guides to find the best flights, cars, holiday packages and more!